Bedi International School always focuses on to bring out the innate talent of the students through the versatility of curricular and academic activities conducted throughout the year. The session began with judging the creativity of the students by conducting “Poster Making Competition” for Group C & D. It was conducted on 22th April to celebrate the World Earth Day. This competition was based on theme “Let’s Keep Our Earth Green & Clean”. The students made lovely posters and imaginative drawing using their creative skills. Students played with colours, smeared the white canvasses with a spectrum of colours and gave vent to their imagination. They poured their creativity and talent. To come up with flying colours in all the fields has always been a trend of BIS and to prove this, an excellent display of writing skills was seen when Article Writing Competition was conducted on 1st May. The students participated with a great zeal and wrote articles in a very creative and innovative way and also expressed their thought provoking views in their articles. To celebrate International Energy Day English Calligraphy Competition was also conducted on 3rd May. World Population Day was celebrated on 11th July with a Special Assembly in the morning. A “Slogan Writing Competition” based on theme “To Create Awareness about Regulating Population” was also held which threw light on the innate talents of the students. Group Discussion was also held in the classes on the same topic. All the participants expressed their views in a great manner. A Special Assembly was conducted to celebrate “World Peace Day” on 6th August. From 11th August to 16th August Heritage week was celebrated. 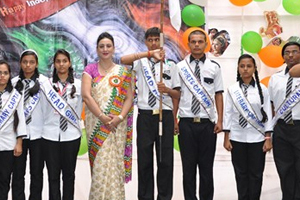 In this week students of classes VI to VIII got opportunity to take part in the competition “India My Dreamland”. Students of these classes made their own India of their dream by using different materials of art & craft. Independence Day was celebrated with great patriotic spirit on 15th August. Exhibiting the excellence of thoughts, the students captivated the minds of the audience by stirring their souls with their argumentative talent through the “Inter House English Debate Competition” for classes VI to XI conducted on same day. Teachers’ Day celebration was conducted by the school to honour Dr. Srvapalli Radhakrishnan and to encourage the contribution made by the teachers by bestowing knowledge, enlightening and shaping the career of the students. On this great occasion “Inter House Dramatics Competition” was also conducted. In this competition the efforts of each House’s participants and organizers were praise worthy. Special Assembly was conducted on 8th September to celebrate “World Literacy Day”. The students were explained by the Principal the significance of this day. Special Assembly was also conducted on 15th September to celebrate “Hindi Diwas”. On this day “Hindi Doha Recitation Competition” for classes VI to VIII and “Aashu Bhashan Pratiyogita” for classes IX to XI were conducted. The students showed their keen inclination towards Hindi language by these competitions. The month of October saw the students excited and energetic to celebrate “Deepavali”. Students were informed by the teachers the significance of Eco Friendly Deepavali and the students were seen determined to celebrate it and to spread the message of Eco Friendly Depavali to all. To promote the expression of beauty and creativity, Inter Class Rangoli Competition was organized in this month. The students showed their extraordinary talent in this competition and were seen jostling and paving their way to make their team win in this competition. “INNOVATIA-2014” conveying a theme “The Voice of Love” was conducted in the month on 13th November. The students presented exuberant dances revealing different kinds of love. The students dressed in sparking attires performed in front of the audience which was incredible. A huge gathering graced this occasion. Christmas Carnival was held in this month. To celebrate Christmas the students decorated their classes with Christmas bells and masks of Santa Claus. They also decorated Christmas trees to make their classes beautiful. ‘Jingle bell, Jingle bell, Jingle all the way’ Carol singing echoed all over the campus. On celebration of Republic Day Inter House Talent Show was organized in which each House participated with great zeal. The innate talent of the students was shown through this competition. The efforts of each House were praiseworthy and they made the audience spellbound. February The capability of the students was tested through the Quiz Competition. It was held in February where the students showed their knowledge and talent. They were asked questions about current affairs, science as well as about current affairs, science as well as about mathematics. The students enthusiastically took part in it. The month of March is the month of examinations all over the country and the students are busy preparing for the home as well as board examinations. Felicitation ceremony was conducted and trophies for the academics and para-academics were given.